May 1, 2017, 12:31 p.m. The New York Times’s morning news (“narrative news“) podcast will soon come out on weekends as well. Other ambitious Serial-style audio shows are also in the works, the company announced at its NewFront presentation in New York Monday morning. The Times’ presentation included a live rendition of The Daily, hosted by Michael Barbaro with Times executive producer of audio Lisa Tobin, interviewing prolific White House correspondent Maggie Haberman. 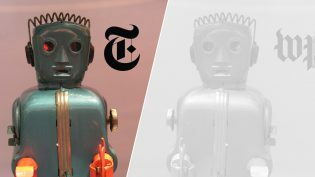 The Times is also exploring how to bot-ify Barbaro, so Times listeners and readers might eventually be able to interact with “him” in the way that users interact with Alexa on Amazon Echo. By mid-April, The Daily had been downloaded and streamed a combined 20 million times since launch, but it’s looking for more: You’ll now also be able to listen to The Daily, as well as other Times podcasts, on Spotify. The Interactive Advertising Bureau-sponsored NewFront are a week’s worth of live press releases (h/t my colleague for the observation) from digital media companies preparing to impress advertisers, so there will surely be more tidbits. Follow along on Twitter. Wang, Shan. "The New York Times’ popular morning news podcast The Daily is coming to weekends and to Spotify." Nieman Journalism Lab. Nieman Foundation for Journalism at Harvard, 1 May. 2017. Web. 18 Apr. 2019. Wang, Shan. "The New York Times’ popular morning news podcast The Daily is coming to weekends and to Spotify." Nieman Journalism Lab. Last modified May 1, 2017. Accessed April 18, 2019. https://www.niemanlab.org/2017/05/the-new-york-times-popular-morning-news-podcast-the-daily-is-coming-to-weekends-and-to-spotify/.